Matthew: Well, this is Trek's first real time travel story. There was a brief scene at the end of "The Naked Time" in which a breakaway speed accident causes a brief trip backward. Apparently, this episode was going to be a 2nd part of that story, in which the Enterprise had been thrown back to Earth of the past. I prefer this iteration, in which the gravitational effect was caused by a rogue "black star" (presumably early terminology for black holes, and more accurate terminology at that), which makes it an accident. Matthew: We get a pretty good tale of a limping Enterprise contending with 60s era defense capabilities. After Captain Christopher is beamed aboard, Spock presents interesting arguments about changing history that make it very unattractive to let him go and pollute the time line. Many scenes in this episode are fun, especially when Kirk is captured by the US military. Matthew: On the other hand, this episode demonstrates some serious time travel logic issues on the part of the writers. 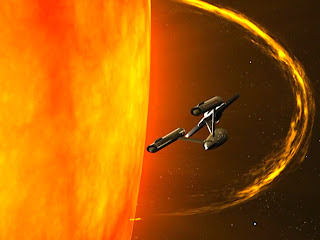 At the end of the episode, we are told that the Enterprise's trip towards the sun will result in a brief trip backward in time, in which Christopher (and another US officer inadvertently picked up) will be able to be beamed back into their original places, with no danger to he timeline because they will have forgotten everything they experienced, since the time will be one before any of these events occurred. Huh? This makes no sense. Capt. Christopher, if beamed into the place of the Capt. Christopher of a day or two ago, will still be the Christopher who experienced the enterprise, heard about his future kid, etc. etc., because HE WAS ON THE SAME TIME TRAVELING SHIP as everyone else! Do Kirk, Spock, et. al. forget everything that just happened? One would hope not, because they still need to fly the ship home... Did everyone on the Enterprise forget everything they learned, since they are now in a time period before they were born? It's just sloppy and a lazy way to solve the problem of knowledge contamination. When they get beamed into the place of their earlier self, is that person destroyed? Annihilated? Or is it just a consciousness that is beamed into their place? Ugh. This sort of crap really irritates me, because it drags me out of the drama. Kevin: I did watch this episode, I swear, but you pretty concisely nailed all my logical problems, so I don't have much to add here. One additional thing, and they did this in The Naked Time as well, is have the chronometer reflecting some sort of "true" time that seems completely independent of their perception. If the chronometer is actually going backwards, why aren't they? 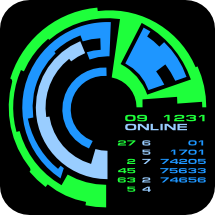 Is the chronometer is some special pocket of subspace that allows it to perceive time changes from an objective viewpoint? Matthew: Now, another thing that bugs me about time travel shows is the notion of "changing" anything at all. Captain Christopher being beamed aboard the Enterprise is just something that happened. It didn't "change" the timeline in any way (as opposed to the Guardian incident in "The City On The Edge Of Forever"). It is clear that it didn't "change" anything, since the Enterprise was still there to beam him aboard. The Enterprise was "supposed" to be there, Christopher was supposed to visit, and he naturally was retuurned to have his space-faring kid. No "changes" were made at any point. But that's more a problem I have with Trek's treatment of (non-quantum-reality shifting) time travel in general. Kevin: What really kills me is anytime the rules of technology or phenomena are vague and tailored to the story instead of the other way around. It's lazy writing and lacks real drama. Time travel, in order to be dramatically interesting can't be an easy solution to the problem, it has to be the problem, or at least an aggravation of the problem. Star Trek IV: The Voyage Home is a good example. At first blush, time travel is an easy out to their problem. In the end, the problems caused by their solution form the dramatic backbone of the film. If nothing else, it silences the question "Why not just do this all the time?" Matthew: Story logic problems include the fact that Christopher wasn't under surveillance or guard when he snuck into the transporter room with a phaser. Really, he wasn't under guard, after Spock warned of unscrupulous behavior? What the heck do security personnel on the Enterprise DO all day? Seriously, this should be the ONE time they're all hepped up with something to do. Kevin: Given the number of times someone breaks into the transporter room and causes mayhem, you think there would be a checkpoint or a retina scan or a TSA agent or something, but no. Just one dude who waits until someone has punched him to think something might be amiss. Matthew: We get good performances all around. Shatner especially is entertaining, with very good comic timing in his interrogation scenes. I liked the portrayal by the actors of the military mentality - sort of a stolid, paranoid, unimaginative bearing that really worked humorously against the more open-minded Enterprise crew. Roger Perry is also good as Captain Christopher, playing the fish out of water with a good sense of wonder and amusement, mixed with a little bit of fear. Kevin: I agree. The interrogation scenes are actually laugh-out-loud funny. Matthew: The use of stock footage was interesting, intercutting between 60's era film of real jet planes and effects shots of the Enterprise. Costumes were also nice, imparting a realistic feel to the 1960's military personnel. Kevin: This is another one of those times where it is impossible for me to not be a product of my time, but I found the stock footage of 60s jets impossibly charming because it was so dated. I also thought the composites of the Enterprise in the atmosphere were good for their time. Matthew: I found it odd from a design standpoint that food slots are in the transporter room. Is a post you have to man without a chair really the best place to be eating lunch? Kevin: This lesson is sadly not learned by the time a hapless Sonya Gomez spills a hot chocolate on Captain Picard in "Samaritan Snare." I think it's just something to put in the wall, and they probably already had a wall with food slots sitting around. This may be one time where their frugality got the better of them. Matthew: "Trek Fu" kind of annoyed me here, with seemingly strapping men being felled into unconsciousness with one punch or worse, a slight chop to the neck. I hope some young nerd watching this doesn't try these moves out in a middle school brawl, hoping that they work just as well as they do for Kirk and Sulu. I understand they can't spend 5 minutes on a realistic, gritty fight scene, but they swing too far into the fantasy realm, here. It is a chronic problem in the franchise, and this is one particularly egregious early example. Kevin: I agree. Even subsequent instances of the Vulcan neck pinch seem to take a second or two longer, and without that time, it looks like Spock flipped a switch. Matthew: Although I'm dubious of time travel shows, especially ones with such slipshod time travel logic, I would still give this a 3. It's the first time they do it, so it gets judged less harshly than some other unfortunate retreads of this concept. The human drama was portrayed well, even if the scientific drama suffered. The actors carry the day for me in this one, saving some bad execution and placing this show squarely in the average category. Kevin: I liked the acting a lot in this episode. There's a kernel of a good idea, but the execution is severely lacking. A lot of the core ideas of causation and hard choices is developed much better in City on the Edge of Forever, so if it took this episode to shake out some ideas, I can live with it. This gets a solid 3 from, making for a total of 6 for both of us.